GorskGeek, you are a “hooligan”, liar, lame, loser, et al. GorskGeek, how would you know ? and review all of them? Why is the Food and Drug Administration FORCING patients to #FAIL conventional treatments; such as surgery, chemotherapy, and radiation therapy, before being allowed to utilize antineoplaston therapy ? GorskGeek, please list all the other phase II clinical trials where the F.D.A. has done this, and please also explain what would you do if the FDA did this to YOUR clinical trials ? “Even doctors who are not oncologists sometimes interpret such anecdotes incorrectly” ? 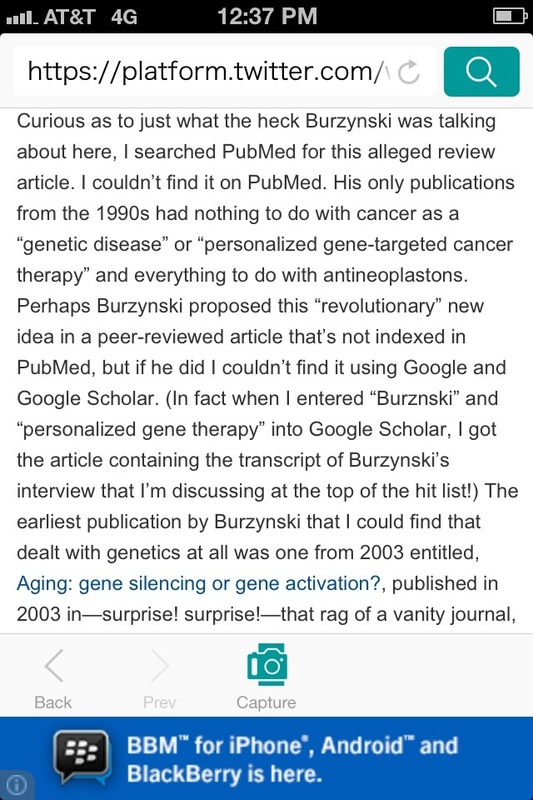 – 1997 – Burzynski. S.R. Antineoplastons. oncogenes and cancer. Anti-Aging Medical Therapeutics, Vol.1. Klatz RM. unaltered and freely available. Please place a link back to this webpage. save it to your computer. Please help distribute it. Thank you. Gavin. not already have it on your computer. This telephone interview with Dr. Burzynski was held in December 2002. The purpose of the interview is to inform people about Dr. Burzynski’s cancer treatment, Antineoplastons. It will be circulated for free on the Internet. I have no affiliations with Dr. Burzynski either personally or professionally. Hello Dr. Burzynski. I would like to thank you for taking the time to inform people about your cancer treatment Antineoplastons, and your experiences in the area of cancer over the last 25 years. Is it true that you were the youngest person in Poland in the 20th century to earn two advanced degrees, an M.D. (Medical Doctor) and Ph.D. in biochemistry at only 24? I’m not sure if I was the youngest, I was among the youngest. In Poland, its 15 years average (Gavin. For a Ph.D.) after you receive an M.D. What motivated you to come to the United States? When did you arrive here? Well basically freedom. You see, I could easily stay in Poland. I was a prominent student, one of the best they ever had in medical school and certainly if I would become a member of the Communist Party I would accomplish a lot in Poland. But I didn’t want to be a Communist and after I declared, “forget it, I’m not going to be a Communist”, they persecuted me. So, practically, it would not be possible for me to do any research in Poland. I arrived in the United States on the 4th of September 1970. You began working at Baylor College of Medicine in Houston? I was not employed for 6 weeks, then I got the appointment at Baylor in the position of research assistant. A couple of years later I became Assistant Professor. I have read that your cancer research was motivated by your observation of a cancer patient in Poland that was missing a particular peptide in their blood, is this correct? Well Yes. First I discovered some peptide fractions in blood and then I was trying to determine their significance. This means that I was screening the blood samples from people who suffer from various illnesses, among them cancer patients. I found some remarkable changes in concentration of these Peptides in cancer patients. Basically there was a great deficiency of these Peptide fractions in the blood of cancer patients. What are peptides and how did your research develop from there to developing Antineoplastons? Peptides are chains of Amino Acids, so if you put together 2 Amino Acids, you have a Peptide. They do, but we are not really interested in making normal cells out of cancer cells. What we are interested in is correcting one basic difference between cancer cells and normal cells, and this is the mortality of normal cells and the immortality of cancer cells. Cancer cells are immortal. And if you change them into mortal cells again they will die and the tumor will disappear. I read a humorous part in Daniel Haley’s chapter about you in his book, “Politics in Medicine.” He says that initially you derived Antineoplastons from your friends blood, but had to change because your friends stopped coming around, is that correct? Certainly it was difficult to obtain a lot of blood for the research. It was a necessity to look for a source that is widely available. I realized from the very beginning that once I use urine, my critics will use this against me; try to just smear me, “That’s the doctor who is using urine to treat cancer.” But there was no other way to do it. There are plenty of ignorant remarks about your treatment because it used to be derived from human urine. The process you use now does not involve collecting human urine. Please describe the complete process you use. Ever since 1980, we are using synthetic analogues of Antineoplastons, made in a state-of-the art biomedical manufacturing facility. These have nothing to do with urine or blood. Would you describe Antineoplastons as natural? They are natural of course, they exist in our body. Your treatment does require a strong commitment from your patients as they must be infused with Antineoplastons for many weeks or months, is that correct? But most of our patients are taking oral formulations. I would say that perhaps 15% of our patients are taking intravenous infusions of Antineoplastons; the rest take capsules or tablets. The patients who have the most advanced type of cancer will require heavy dosages. There is a limitation of how much medicine you can take by mouth. Fifty or sixty tablets a day, that’s pretty much all you can take by mouth. But if you give intravenous infusion you can deliver the equivalent of 3,000 tablets a day. You went into private practice in 1977. How was this funded? Well, I started private practice in 1973. It was not necessary for me to have any funding, because I joined with other physicians. Is it true that Dr. Mask at a hospital in Jacksboro, Texas ran your first human clinical trial? What types of cancers did you treat? What were the results of these trials? I would not call it a clinical trial, because only two patients received initial treatment. They were very advanced, close to death and unfortunately, both of them died. But these cases were not lost because we found we can administer Antineoplastons without having bad side effects. What is the general side effect experienced by your patients when using Antineoplastons? Does it damage the immune system as chemotherapy does? We are not talking about one medicine; we tried 12 different pharmaceutical formulations. Basically it depends what formulation we use, but when we give them orally, we see practically no side effects at all. Patients may develop skin rash, which may last for a day or two. But, when we give large dosages intravenously, we have to watch fluid balance…and electrolyte balance. We don’t see any delayed toxicity once the treatment stops. Everything practically goes back to normal within say a day or two. It does not even come close to the adverse reactions that you experience with chemotherapy. Well basically, we do not charge patients for medicines, Antineoplastons are given free of charge. What we are charging for are supplies, and we are charging for standard services such as office visits, nursing services, Lab tests, consultation, evaluation etc. And these services are priced the same way as the average medical services, and they are covered by the insurance. So if a patient were using the pills, what would it normally cost per month. Antineoplastons is most effective against brain cancer, is that correct? Well, it’s not really correct. Because brain tumors are very difficult to treat, we concentrate our efforts on the toughest type of cancers. Out of our clinical trials, we have eight that came to the final point, which means they proved that there is some efficacy, and six of these are in various types of brain tumors. But there is another clinical trial, which deals with advanced colon cancer, which also proved efficacy and another one with liver cancer. But we still need to wait a little longer to have a larger number of patients treated and then statistically find out if this is going to work. Basically the treatment works when we have involvement of the gene, which can be activated by Antineoplastons, and such genes, like gene p 53, are involved in 50% of all cancers. The treatment turns on gene p 53. So it has more to do with what kind of gene the patient has in his cancer cell, rather than the type of cancer. Is there a special diet to follow when using your treatment? Is your treatment being used in any other countries? Yes, we have people coming to us from all over the world. I think we can probably count easily 70 to a 100 countries from which people are coming. But the main effort is now in Japan, outside the US. In Japan there are 2 clinical trials being conducted by Japanese doctors. Also, a group of doctors in Mexico obtained approval from the FDA and Mexican government to do clinical trials. Now I have several related questions about brain cancer in children. Dustin Kunnari and Dr. Burzynski. Dustin is one of Dr. Burzynski’s great success stories. Dustin had brain surgery at 2 ½ years old. The surgery removed only 75% of the tumor. Dustin’s parents, Mariann and Jack, were told that Dustin would only live for 6 months. Chemotherapy and radiation may extend Dustin’s life slightly, but at a very high cost in quality of life with very serious side effects. Mariann and Jack decided to look into alternatives. They found out about Antineoplastons and after only 6 weeks of intravenous treatment, Dustin’s MRI showed he was cancer free. One year later another tumor appeared on the MRI. By this time Dr. Burzynski had developed a more concentrated form of Antineoplastons. After 5 months the tumor was gone. Dustin has remained cancer free ever since and was taken off Antineoplastons when he was 7. Dustin is 12 today. About how many children suffer from brain cancer in the US each year? The statistics are available for 1999. The new cases of brain tumors in children were counted as 2,200. Now around 3,000, I would say. Approximately what percentage of children is still alive after 5 years using orthodox treatments for brain cancer? It depends on the type of tumor and it’s location, some of the toughest are those that are located in the brain stem. Up to 5 years, you have practically no survival when you use the best treatment available, which is radiation therapy. Chemotherapy usually doesn’t work for such patients. After 2 years, 7 % survival. After 5 years, practically none. To further complicate matters, Dustin’s oncologist kept threatening his parents with a court proceeding to take Dustin away and force him to take Chemotherapy/Radiation treatment. This continued for a year, even after Dustin’s success with Antineoplastons. You may also e-mail Mary Jo Siegel, the lady who runs the web site. Mary is also a cancer survivor using Antineoplastons. Is it correct to say you have had very good results when treating brain cancer in children? Yes we have. I gave you the example of the toughest, which is located in the brain stem. We get about 40% survival rates after two years. After 5 years at the moment we have about 20% survival rate. The reason is that most of the patients who come to us, have received prior heavy radiation therapy, or chemotherapy. They usually die from complications from these treatments. Those who survive the longest are patients who previously did not receive radiation therapy or chemotherapy. The longest survivor in this category is now reaching 15 years from the time of diagnosis; and she’s in perfect health. With the more common variety, which is aciotoma located outside the brain stem, we get much, much better. We have 75% of patients who are objectively responding to the treatment. This means that the tumor will disappear completely or will be reduced by more than 50%. This is another strong point. It’s extremely important. Children are usually damaged for life after radiation therapy, when we can avoid it and bring them back to life. What criteria must parents of children with brain cancer meet before being able to have their children treated by you? Well, practically all of these brain tumors must be inoperable. This means that it’s not possible to remove them with surgery. Except for one category, they should have advanced disease. The tumor should have the size of more than 5 mm in diameter and be located in a place that cannot be operated upon. There is one category of these tumors, medulloblastoma, where the FDA requires that the patients would receive prior standard treatment and fail before we can accept them. In the rest of these children we can accept them without failure of prior treatment. Roy , a more recent patient of Dr. Burzynski’s. Let us talk a little about some of your most successful stories using Antineoplastons with children. Probably the most remarkable case is that of Tori Moreno . In August 1998 Tori was diagnosed with a stage 4 brainstem glioma that was inoperable. Her parents were told she would die in a few days or at the most, a few weeks. When did you start treating her? MRI criteria. She is a perfectly healthy child and tumor free. She still takes small dosages of capsules of Antineoplastons, but we will discontinue this shortly. Tori Moreno 9.28.98. Temporarily enlarged due to taking Decadron. Tori’s parents were told there was nothing that could be done for her and she would be dead in a few weeks. Tori is alive and well today thanks to Antineoplastons. See photo below. At the end of this interview, there is a short interview with Kim Moreno, Tori’s mother. Kim Moreno has set-up a Yahoo e-mail account to answer peoples cancer related questions. And today she is over 5 years old? Yes, she’s 5 years old and living a pretty much normal life. Tori 22.10.02. A perfectly healthy child. Orthodox treatment consists of high does of radiation therapy and possibly toxic chemotherapy as well. Most of the children are dead in a few years. The ones that survive suffer from permanent retardation, along with other serious side effects from the radiation. Please do not forget about the interview with Kim Moreno, Tori’s mother, at the end of this interview. But mainstream medicine has been trying to kill the cancer cell using chemotherapy and radiation, is that correct? Chemotherapy and radiation cannot differentiate between healthy and cancerous cells? They can differentiate to some point, but basically, this difference is very small, so ultimately, the normal cells will be killed. Is that why they have such a terrible effect on the immune system? That’s right, not only the immune system, but also many other systems in the body. Practically, the treatment is destroying healthy parts of the body. Chemotherapy and radiation also cause cancer, don’t they? Yes. For instance right now we see a lot of patients who in childhood were successfully treated for leukemia or for Hodgkin’s disease. Then they develop cancer that is practically incurable, like lung cancer, breast cancers; I even encountered a patient in my practice that developed three different types of cancers, and was only 28 years of age. First she was treated for Hodgkin’s Disease, then she developed bone cancer in the places which were radiated for Hodgkin’s Disease, and then she developed breast cancer after that; it’s really horrible. So there is increased incidence of secondary cancers in patients who were treated previously with chemotherapy and radiation. Shontelle Huron. In remission for several years after using Antineoplastons. Ric and Paula Schiff write about the torture their daughter Crystin had to endure during chemotherapy/radiation treatment. Crystin was diagnosed with perhaps the most malignant tumor known, which is a rhabdoid tumor of the brain. Of course, historically, there was no case of such a tumor ever having a long response to chemotherapy or radiation therapy. She received extremely heavy does of radiation therapy and chemotherapy, because nobody expected that she would live longer than a year or so. So unfortunately she was terribly damaged with this. She responded very well to Antineoplastons. We put her in complete response. But unfortunately she died from pneumonia. Her immune system was wiped out, so when she aspirated some food, she died from it. The autopsy revealed that she didn’t have any sign of malignancy. But there are also likely permanent severe health concerns related to taking chemotherapy and radiation. Is it true that if parents refuse chemotherapy/radiation treatment for their children the hospital, via the courts, could have the child removed from the parents care and forced to take chemotherapy/radiation treatment? Yes, unfortunately in some States, the law may require taking children away from the custody of the parents to send them to such treatments. Jared Wadman. In remission for several years after using Antineoplastons. Isn’t this what happened to Donna and Jim Navarro when they chose your treatment over orthodox treatments? That is correct. Thomas Navarro was diagnosed with medulloblastoma. He was operated on and the tumor was removed. Then he was scheduled for radiation therapy. Since he was only 4 years old, the parents knew that he’d be damaged by radiation therapy. Nobody at his age survives this type of tumor anyway after radiation therapy. So that’s why they decided to come to our clinic. Unfortunately I could not treat him because FDA requires failure of radiation therapy for such patients. And tragically he died in November 2001. What happened was, the parents decided not to take any treatment. We asked the FDA several times to allow administration of Antineoplastons, because we have already had successful treatments for some other children without any prior radiation. Then ultimately he developed numerous tumors in May the following year. Then we suggested to the parents of Thomas, that if they are not going to take our treatment, they should go for at least chemotherapy. They went for chemotherapy to one of the best centers in the country, to Beth Israel Hospital in New York. The chemotherapy was successful, but he almost died from it. It severely affected his bone marrow. I remember a phone call from Thomas’s father telling me that the doctors are thinking that they won’t do anything else for him and that Thomas will die within a week because of severe suppression of bone marrow. But I encouraged his father to do whatever is possible because such patients may turn around. Fortunately he turned around, but about a month or two later he developed 15 tumors in the brain and the spinal cord. Then, when he was close to death, when nothing was available for him, the FDA called us and told us now we can treat Thomas. When we treated Thomas he survived 6 months, and the tumors had substantially decreased, but ultimately he died from pneumonia. Is it accurate to say that the initial orthodox treatment for brain cancer is surgery to remove the tumor? If the tumor is located in the proper part of the brain. For some locations it is out of the question. But, you are right, that is the first step. Does surgery alone ever cure a patient with brain cancer? Well, some cases, with benign brain tumors, when the tumor can be completely dissected, yes, it’s possible. But in most cases it’s not possible. How much of a risk does surgery present regarding spreading the cancer more quickly and other complications? Well, not so much regarding spreading the cancer more quickly in the case of brain tumors. Such a spread may happen only with a small percentage of brain tumors that have the highest aggressiveness. But for most of the patients the tumor is not going to spread just because of surgery. Certainly surgery may damage the brain and patients may even die during the surgery. It’s not the ideal thing to do of course because you are removing the tumor and you are removing a healthy part of the brain at the same time. The patient may be permanently damaged by such procedures. Would you warn against rushing into surgery in light of how effective your treatment is? Would you most times recommend trying your treatment first? We really would like to know what we are dealing with. This means that we would like to have at least a biopsy; if by chance it’s not going to create sufficient risk for the patient. If the tumor was located in such a place in the brain where surgery is possible, then certainly we could try to remove the tumor. But I think it would be best if we can treat the patient with brain intact and get rid of the tumor completely, because then we risk the least damage possible. Now I will turn my attention to your legal battles with the FDA. They began in 1983 when they sued you in civil court, is this correct? In 1983, that was the first court battle with the FDA. The FDA sued us. It took about 6 weeks in court and again, we won. Then there was an enormous raid by the FDA at your offices on July 17, 1985. What was the reason for this raid? We were never given a reason. I think there was a concentrated action against a few alternative medicine centers because at the same time there were similar actions in the Bahamas and in some other places. In the four court cases the FDA has brought against you, have any of your patients testified against you? Well, on their own will, nobody testified against us. But the FDA encouraged some of our patients, and threatened them in various ways. They forced them to come to the witness stand. But really, once they were on the witness stand they behaved more like our witnesses, not FDA witnesses. According to Daniel Haley, after the FDA lost its last court case against you in 1997, Congressman Richard Burr said it was “one of the worst abuses of the criminal justice system”. Did Burr ever speak to you about it? Yes, we talk with Congressman Burr. I believe he is right, because certainly there was no reason for such massive action on the part of the FDA. They knew that the treatment works; that the treatment helps patients, that the patients will die if they win, so they should not do it. All of this was with the taxpayer’s money. So the FDA has wasted many millions of taxpayer dollars trying to convict you on false charges of transporting Antineoplastons across State lines. What was the motivation for this vendetta? Well, it’s hard to tell, because it was never properly investigated; why they did it. But, we have some leads. For instance, on one side you have a large pharmaceutical company, which was very interested in getting hold of our patents; this is Elan Pharmaceutical. It happened that I treated successfully a close relative to the CEO of Elan. Elan became very interested in what we have. They came close to signing a final license agreement. But after they learned what we have, they decided to withdraw and then suddenly the FDA and NCI gave their full support to Elan, to do clinical trials with one of the ingredients of Antineoplastons, phenylacetate. This was a large pharmaceutical company that was trying to appropriate my invention. On the other hand, within the FDA and NCI you have had people who were working closely with this company. For instance Mary Pendergast, who was responsible for the legal action against us, became Vice President of Elan. Also Doctor Michael Friedman, who was initially in charge of NCI cancer research, and who knew that our treatment works, later became commissioner of FDA and he did whatever he could to put us out of business. Not only that, but to simply destroy me. On the other hand, suddenly the government decided to file for the patents, which claimed the same thing that our patents did. Never in the history of the United States do you have the issuance of two patents for the same invention. It was really a breach of patent procedure. The patent office allowed them to patent something I invented, and which I patented. And dishonest scientist Dr. Dvorit Samid, who initially worked for us, was receiving funds from us and finally went for the higher bidder (Elan). So you have a lot of leads, which indicate that there was something between the government, dishonest scientists like Dvorit Samid and the large pharmaceutical company, Elan. And it was in best interests for them to get rid of me, destroy me, so they could appropriate my discoveries and benefit from that. When did you initially apply for your Investigational New Drug (IND)? We applied in May 1983. When did you receive it? posted here very soon. Thank you. Gavin. Tony Tondelli. In remission for several years after using Antineoplastons. It is important for everyone to understand the economics of the drug industry. I have heard that the cost today for bringing a drug to market is upwards of 500 million and takes about 12 years, is that true? The drug company is then given a 17-year patent so that it can make a profit on the drug. It is little wonder the drug companies fight against natural treatments such as Laetrile, because they are unable to patent them and they pose a serious threat to their profit margins. But you are able to patent your treatment, so why was there no interest in it from the drug companies? Basically you have 17 years from the time when you have approval of the patent and this is independent from FDA’s approval process. You file the patent, once you make a discovery, and then you go through FDA procedure. You spend say 12 years or 15 years for the approval process, then you have only 2 years license from the FDA, because license is going to expire in another 2 years. Certainly the pharmaceutical companies are spending a lot of money in this process. In our case I decided to develop this on my own, to generate money from my private practice and use the money to support the research of Antineoplastons. Again we were approached by many different pharmaceutical companies, which were interested in working with us. Certainly after the bad experience (with Elan) we are very cautious with whom to deal. On the other hand pharmaceutical companies were afraid of action from the FDA. The NCI put off testing Antineoplastons using the fact that it failed their standard P388 leukemia mouse test, is that correct? What is the P388 leukemia mouse test and why did Antineoplastons fail it? Well we had informed the NCI that this was a bad type of test for antineoplastons. Antineoplastons seems to be specific for species. Different animals have different antineoplastons; mice have a different composition of antineoplastons than humans. Practically, human antineoplastons may work well in humans, but they may not have much activity in mice. We knew this, even before the NCI began testing. On the other hand we didn’t have good results at all in the acute form of leukemia and we didn’t even accept such patients. It was known that if they only do this type of test, it was not going to work. They still tested and used this to say that Antineoplastons don’t work against cancer. Certainly the fact that something works or doesn’t work against mice leukemia is irrelevant. I’d like the reader to bear with me in the next few questions, as the point will become clear. One of the chemicals you identified in the peptides was phenylacetate. But it was far inferior to the others and you chose not to patent it, is that correct? This is not a peptide, this is a metabolite of our antineoplastons and it’s an organic acid. So this is a final metabolite of antineoplastons. It has some anti-cancer activity, but the weakest of all antineoplastons. We knew about it and that’s why after some preliminary experience in the treatment of phenylacetate back in 1980, we decided that it’s not worth pursuing this and then we used antineoplastons that have higher activity. But didn’t you later find out that the NCI actually holds the patent for phenylacetate? You’re right. NCI is the owner of the patent, Dr. Samid is the author but Elan has the license to use these patents. All of these three work together. Why did the NCI patent something that was far inferior to your other Antineoplastons? Because they knew that this was the only chance that they can get hold of something which has to do with antineoplastons. The NCI ran clinical trials on phenylacetate in 1992 and found it to be worthless, is that correct? Well, the clinical trials began in 1992 but it took a few years to have the results. It shows some effectiveness in brain tumors and in prostate cancer. But of course it was far away from the results that we can get with antineoplastons. When did the NCI eventually start clinical trials of Antineoplastons? I assume you gave the doctors running the trials all the information about correct dosages, is that true? Yes, well, basically they used dosages that were 50 times lower than what we feel are effective dosages. We have some patient’s relatives who were present when the treatment was administered. Formulations of antineoplastons were badly diluted. This means that the patient was receiving very little antineoplastons and some of these patients were removed from the treatment after a short period of time because they were overloaded with fluid. Well normally we see fluid overload in perhaps less than 2% of our patients. So it makes sense that perhaps the formulations of antineoplastons were diluted and when the Mayo Clinic (1999) determined the concentration of antineoplastons in blood, we realize that it was something like 50 times lower than what it should be. Do you think the NCI purposely sabotaged your trials? I have no doubt about it. They sabotaged the trial; they accepted patients who were too advanced. Their main effort was to give a low dose of the medicine for a short period of time and to stop treatment just for some minor problem, like if a patient developed a skin rash. They were trying to give the treatment only for a very short period of time, like for instance a couple of weeks or a month. And then of course the patient was dying after that. It was completely unethical, it was horrible. As you probably heard recently, the pharmacist who was diluting an anti-cancer drug, was sentenced to 10 years in prison. I think the same should happen to these guys who really were trying to use this for their political manipulations. Jessica Kerfoot. In remission for several years after using Antineoplastons. How much influence do the pharmaceutical companies wield in medicine in the US? Extreme influence. Most of the oncologists, I’m talking about reputable oncologists, they work for pharmaceutical companies, they work in clinical trials, they receive various type of incentives from pharmaceutical companies. And basically these doctors are approving medicine, FDA may approve the medicine, but finally this advisory board may advise FDA to go ahead with this or do not approve that medicine. So really the doctors who are deciding if the medicine should be approved or not, practically all of them have some type of relation with large pharmaceutical companies. Is there a conspiracy to suppress other treatments or is it just a case of avaricious businesses, the pharmaceutical and hospital industry’s, doing everything in their power to protect their bottom line? Well certainly they have a lot of power. When I filed my application for IND, the standard FDA policy was such that they would never approve a new drug for an individual owner, only for the large pharmaceutical companies. And that’s why I believe we waited for such a long time to receive the go-ahead for our clinical trial. So certainly there were obstruction tactics. Whether this is a conspiracy or not is hard for me to tell. As you can see, the leads which I presented, like for instance a researcher who worked for me initially and then decided to go to the higher bidder, which was a pharmaceutical company; then the relationship between the pharmaceutical company and governmental agencies. All of this indicates that there is some type of conspiracy. I think a Congressional committee should study this. Turning our attention to the doctor/oncology profession. When reading Thomas Elias’s excellent book, “The Burzynski Breakthrough”, I was struck by how many times patients said that their oncologists were aggressively opposed to them taking your treatment. Even after a patient’s success with your treatment, very few doctors give you the credit. Is this due to jealousy, arrogance, plain old denial or something else? Probably a lot of arrogance. We have some prominent specialists, the best specialists in the world who really acknowledge our results and would like to work with us. On the other hand you have some doctors who hate to see a patient with success on our treatment. The fact that the patient is coming to their office, years after the patient should be dead, is something like a slap in the face. They hate it. They will do everything they can to lie, to obstruct the information about this patient. We have a lot of evidence that oncologists were lying about the patient’s condition. For instance the patient recovered completely from highly malignant cancer and the oncologist was telling us the patient died from cancer. So certainly, we have a lot of evidence about some of these doctors who are dishonest, who are liars, who cheat. But on the other hand you can’t really put the same label on the entire profession. There are many other doctors who are honest and who like to know about what we have. Of course our clinic has board certified oncologists who are taking care of our patients. Would you agree with these sentiments? What have your experiences been? Well certainly, I think he’s right; unfortunately that’s the truth. We spoke about Crystin Schiff briefly before. This is a particularly despicable story, because when Ric Schiff asked Dr. Michael Prados, then head of neuro-oncology at University of California at San Francisco Medical Center (UCSF), if he knew of any other treatment besides chemotherapy/radiation for Crystin’s brain tumor, Prados replied in the negative. But a few years before, he had sent you 14 letters documenting the effectiveness of Antineoplastons on Jeff Keller, another patient with brain cancer. Is this story true? Yes, it’s true; of course Jeff Keller had an extremely malignant brain tumor. He had a high-grade glioma of the brain; he failed radiation therapy and additional treatments. He responded extremely well to our treatment. He was one of the patients whose case was presented to the NCI. So there was no doubt about his response. Dr. Prados knew about it. If he was dealing with a hopeless tumor like Crystin Schiff, why didn’t he call us? Ryan and mother Cindy. Ryan is in remission for several years after using Antineoplastons. It’s hard for me to tell. It happens that Dr. Prados and Dr, Friedman, who became the boss of the FDA, came from the same medical school. So they work closely together, and perhaps there is something to do with the general action against us. It would be inconvenient for Dr. Prados to say that the treatment works if FDA was trying to get rid of us and when his friend was Commissioner of the FDA at that time. Perhaps that’s the connection…. One of your greatest critics is Saul Green (Ph.D. Biochemistry), a retired biochemist from Memorial Sloan Kettering. In 1992 the Journal of the American Medical Association (JAMA), published Green’s article, “Antineoplastons: An Unproved Cancer Therapy.” What were his conclusions about Antineoplastons? Well, Green is not a medical doctor, he’s a retired biochemist; he never reviewed our results. He got hold of some of our patents and that’s what he based his opinion on. He was hired by another insurance company (Aetna) that was in litigation with us. He’s like a hired assassin. Not telling the truth. So really to argue with him is good for nothing. Even if something were completely clear he would negate it. He is simply a guy who was hired by our adversaries. He would do whatever they paid him to do. Paul Leverett was diagnosed with a glioblastoma multiforme grade 4 brain stem tumor in May 1999. The prognosis was that he would probably be dead before the end of 1999. Orthodox medicine gave him no hope of survival. Paul was given the maximum amount of radiation he was capable of receiving. It slowed the tumors growth slightly, but this did not alter Paul’s prospects for survival at all. After completing some research on the Internet Paul learned about Dr. Burzynski’s Antineoplastons. Paul began taking Antineoplastons intravenously, administered by his wife, in September 1999. After 6 weeks Paul’s tumor had grown by only 2 %, Glioblastoma’s normally double in size every 2 weeks. A PET scan in December 2000 confirmed that Paul was in complete remission. He stayed on Antineoplastons until August 2001 to ensure the tumor would not reoccur. There is just under 20% tumor necrosis remaining in his brain stem, which is probably scar tissue. Paul’s oncologist (at MD Anderson, Houston) initially wanted to show his scan’s to his hospitals (MD Anderson) tumor review board. But then, for whaever reason, he refused further contact with Paul and did not go ahead with it. The photo was taken with his wife Jennie. Paul had a web site created in order to inform people about his cancer experiences. Did Green ask to look at your patients’ files or even talk to any of your patients themselves? You responded with an article with 137 references, did JAMA publish even part of it? JAMA refused to publish the article. They decided that they would publish a short letter to the editors. And obviously this is another dirty thing, because letters to the editors are not in the reference books. If you look in the computer and try to find letters to the editor from JAMA, you’ll never find it. So people who are interested will always find Green’s article, but they will never find our reply to Green’s article, unless they go to the library. Then they can look in the JAMA volume in which the letter was published, and then they will find it. So many doctors were asking me why I did not respond to Saul Green’s article because they never found my letter to the editors. Are they obligated to publish your rebuttal? Certainly they are, because they put Green’s article in JAMA in the first place, they accepted it without any peer review and then they did not allow me to honestly respond to it. I should be allowed to publish my response to the article in JAMA. At the time of the publication Green was working as a consultant to Grace Powers Monaco, Esq., a Washington attorney who was assisting Aetna insurance agency in its lawsuit against you. What was the Aetna lawsuit about? One of our patients sued Aetna because Aetna refused to pay for my treatment. Then Aetna got involved and Aetna sued us. Aetna really became involved in what you can call racketeering tactics because they contacted practically every insurance company in the US. They smeared us, they advised insurance companies to not pay for our services. So based on all of this, our lawyer decided to file a racketeering suit against Aetna. This was a 190 million dollar lawsuit against Aetna. So certainly Aetna was trying to discredit us by using people like Saul Green. And they hired him to work on their behalf. So there was an obvious conflict of interest for Green because he worked for Monaco who was assisting Aetna. Was this information published in the JAMA article? 1. At the time Burzynski was in school, medical schools did not give a Ph.D. He cites the people below as giving him some of this information. 1. Nizanskowski, R. ,Personal communication. Jan 15, 1992. First of all, do you have a Ph.D.? Well, the program in Poland is somewhat different than the US. What I have is equivalent to a US Ph.D. When a medical doctor in the US graduates from medical school, he receives a medical doctor diploma. In Poland it’s a similar diploma, but it’s called a physician diploma, which is equal to medical doctor. And after that, if you would like to obtain a Ph.D., you have to do independent research, both in the US and in Poland. So you have to work on an independent project, you have to write a doctorate thesis and, in addition, to that in Poland, you have to take exams in medicine, in philosophy and also you have to take exams in the subjects on which you have written your thesis, in my case this was biochemistry. As you can see from the letter from the President of the medical school from which I graduated, this is a Ph.D..
Saul Green got information from the guys who were key communist figures in my medical school. The second secretary of the communist party in my school, hated my guts, because I didn’t want to be a communist. So, somehow, Green got hold of “reputable” communist sources (laugh) to give him that information. It is exactly the President of the medical school who certified that I have a Ph.D.. So you are saying that theses people he received his personal communication from, Nizanskowski R, and Bielinski S, are both Communists, is that correct, or they were? Not only communists, but Bielinski was one of the key players in the communist party in my medical school. So certainly he was extremely active as a communist. And, you know that communists, they usually don’t tell the truth. So there is absolutely no question about it, you have a Ph.D. and Green’s doubts are totally without foundation. Has he ever acknowledged publicly the fact that you have a Ph.D.? He’s never got in touch with me regarding this. There are some mainstream oncologists who have stated publicly that your treatment works such as Dr. Robert Burdick, oncologist and professor at the University of Washington Medical School. He is one of the top experts in this field. Dr. Burzynski, there are undoubtedly many people alive today solely because of your treatments, but there could be many hundreds or thousands more alive if the public was given free access to your treatment. Do you see this ever happening? I see this happening within a few years. We already have 8 clinical trials that prove efficacy of the treatment. However, we still need to treat more patients, because in each of our clinical trials it is required that we treat 40 patients. If we are talking about 78 clinical trials, then the number of patients that need to be treated is about 3,000. We are moving forward, probably in another 2 to 3 years we will have final approval. You have fought the government on behalf of your patients’ rights for over 25 years. There must have been a few times when you considered calling it quits. What has sustained you over the years and kept you fighting? spend millions of dollars for the research, which I did. And I could go to some other country and practice. But I feel that this is my obligation because what I am doing is right. I’m saving peoples lives. So why should I give in to some mediocre characters, to liars, to people who really misrepresent what I do. And if I fail, then America will fail also. Because really America is the bastion of Democracy in the world. If America is rotten, then the whole world will go down to hell. 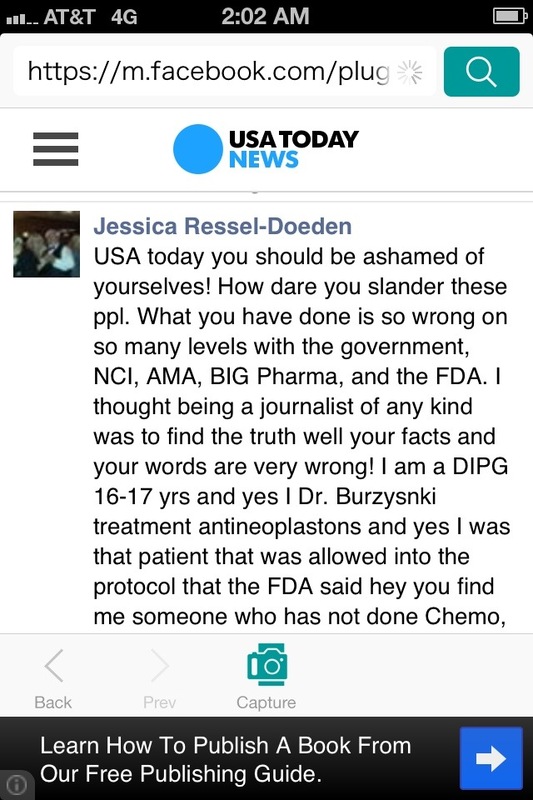 So if something is rotten in the Patent office, in the NCI and FDA, it is the duty of the citizen to show that this is rotten and should be corrected. There are a number of good people who can make it work, so why should bad people erode and destroy the entire system. I felt that this was my obligation; I felt that I was right and even if I had to go to prison, I would fight for it, because this is the right thing to do. Otherwise I could not look at myself in the mirror. I would despise myself. Do you think we will we ever have medical freedom of choice in the US, where we can choose whatever treatment we want for cancer? I am not sure if this will ever happen. But at least I am hoping that the movement, which we pioneered, like this alternative medicine movement, will bring a lot of good to the American people. After all, now you have official recognition of alternative treatment, more or less, and this is because of our fight. If we wouldn’t fight at that time, then perhaps it would not happen, but maybe it would happen another ten years from now. Standard medical practices and the observations of physicians who are outside the medical establishment are extremely important, because anybody can make a discovery and improve the health of people. This I think is an important movement, but whether the people of America will ever have a chance to select whatever treatment they want, is another story. 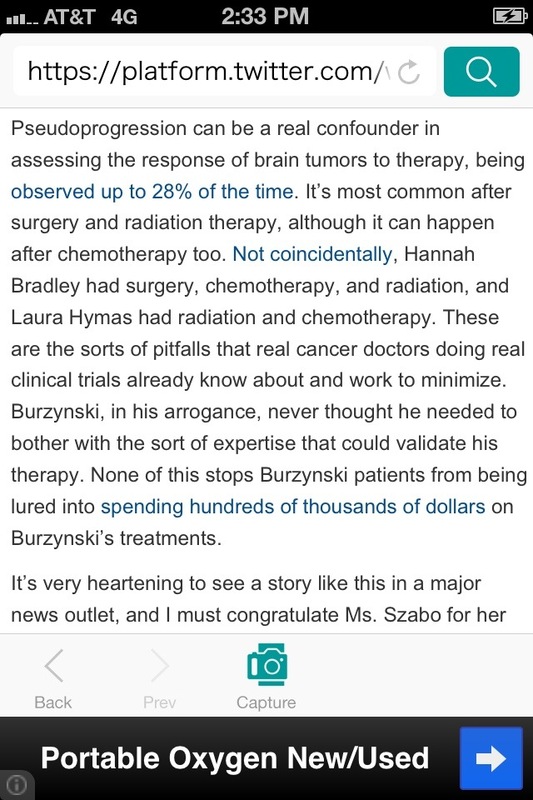 Finally Dr. Burzynski, a hearty thanks to you for keeping your treatment available to cancer patients, for keeping your oath as a doctor and putting the patient ahead of financial gain, and of course, for saving lives. Please keep up the great work. Thank you for giving me the time to conduct this interview and inform people about your work and treatment. Please be aware. Orthodox medicine often states that people who have recovered from cancer by unapproved methods did so due to a “spontaneous remission”. This means that the cancer just disappears for no apparent reason. First of all, I do not know of any documented cases of spontaneous remissions in brain cancer. In other serious cancers it is so rare as to be unworthy of discussion. But here is the most crucial point. A true spontaneous remission is when the cancer goes away without any treatment, either approved or unapproved. It’s absurd to suggest that someone who received large amounts of Antineoplastons, and is then cancer free, had a spontaneous remission. If someone has surgery to remove a tumor and they are cancer free for years, we know it was because of the surgery. Also remember that in many cases cancer patients turn to Antineoplastons (and other so-called alternatives) after chemotherapy and/or radiation have failed. If the patient goes into remission, oncologists often state that it was a delayed response to their treatment. This is a very convenient situation for oncologists. 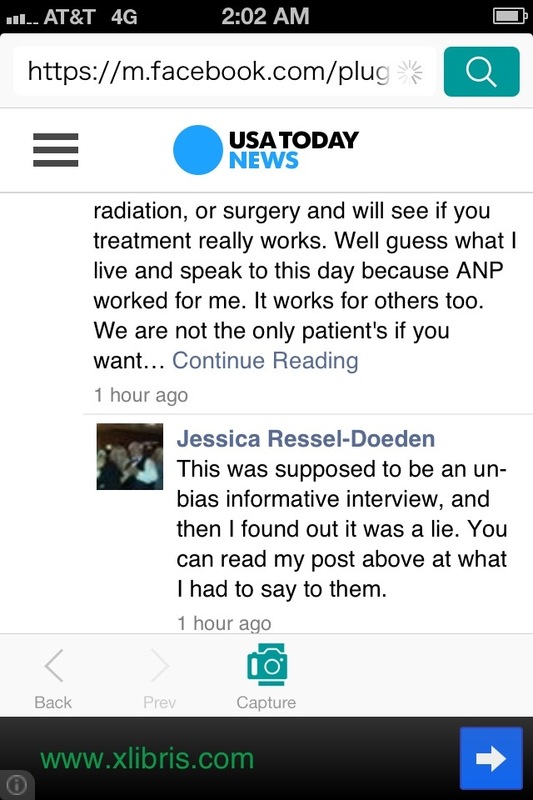 When their treatments fail, they still claim the credit for the patient’s recovery, even after the patient has been on Antineoplastons (or other treatments) for months/years. Dr. Burzynski’s clinic can be reached at 713-335-5697. Kim Moreno’s short interview is below. Kim also has an e-mail account she specifically set-up for people to contact her about her experiences with Dr. Burzynski, oncologists, Antineoplastons and cancer treatments in general. Any e-mail unrelated to these subjects will be deleted. Some other Internet links that may be of use to you in your research. Thank you for taking the time to inform people about your family’s experiences while your daughter Tori was taking Antineoplastons. Tori was first diagnosed with a Stage 4 brain stem glioma in August 1998, is that correct? The doctor’s basically told us to take her home and prepare for her to die. Were there any records of anyone surviving with this type of cancer, using orthodox treatments? None that they could provide us with. How many cancer centers did you visit? We originally were at Miller’s Children at Long Beach Memorial and then went to City of Hope. We also sent her MRI’s to Dr. Fred Epstein in New York to be looked at. And they all said the same thing, Tori’s brain cancer was fatal and nothing could be done? How long was she expected to live? Yes, they all said there was nothing we could do. She was given 2-6 weeks to live. How did you find out about Dr. Burzynski and Antineoplastons? On the Internet on a brain tumor support group. We read a letter from a father whose daughter was on the treatment. Did you ask your doctors about Burzynski? Had they heard of him or researched his treatment? Yes, we asked all of them about it. Most frowned at the idea, the oncologist refused to see her if we took her to see Dr. Burzynski. The only one who told us that he thought Dr. B might have a good chance with helping us was Dr. Fred Epstein. When did you first visit him? Did he tell you he could cure Tori? No. He said he thought Antineoplastons would help her, but he wasn’t sure he had enough time. He was very upfront and honest with the statistics he had with her type of cancer but offered no promises. How much Antineoplastons was Tori taking? I can’t even remember what dose she ended up on when she was taking it intravenously. What were the side effects? In the photos you sent me, Tori is greatly enlarged, I assume due to fluid retention. Is that what it was? How was that alleviated? Were there any other side effects due to the Antineoplastons? We always had to monitor her potassium and sodium. So, she had to drink a lot of water and therefore we went through a lot of diapers. Those were the worst of the side effects. In the picture, she was so large due to being on Decadron, which we were able to wean her off of in January 1999. Were you surprised when Tori started responding? Yes, I have to say I was. It is hard to believe something great is going to come out of something so painful. I guess she taught me not to lose faith in life. How soon was it before Tori’s brain tumor started reducing in size? Immediately. It had shrunk in size by 20% after the very first MRI, which I believe was in 6-8 weeks…it’s been a long time and a lot of MRI’s later. For how long did Tori continue to take Antineoplastons intravenously? Did you administer this yourself at home? She took them through IV for 2 years and yes; we did this all at home. Does your insurance company pay for the treatment? Did they try to avoid paying for it? No, they do not pay for the treatment. I understand Tori is 5 today. Is she still taking Antineoplastons? Has the tumor completely gone? Yes, she just turned five in June. She still takes Antineoplastons orally…. she takes 40 capsules a day. Her tumor has decreased in size by 86% and they believe what is left may be scar tissue. Has Tori suffered any permanent side-side effects from Antineoplastons? Not one. In fact, it decreased her symptoms dramatically and never caused her any harm. So Tori is cancer free and side effect free today? This is an incredible story Kim. Your child was diagnosed with a fatal brain cancer and the best oncologists and surgeons in America told you it was hopeless. Yet you found a cure for your child, without the billions, and so-called cancer specialists, that the NCI has at its disposal. Have any oncologists or doctors asked you about Dr. Burzynski’s treatment? They tend to ask very quietly, but never really respond to what I have to tell them. There is curiosity there, just no one is really willing to step up to the plate and believe that the antineoplastons had something to do with her survival. What do they say now that Tori is alive and well? The neurologists told us that sometimes it happens and they called it “spontaneous remission”. Again, I asked them to provide some statistics and there were none to be seen. That is of course the height of absurdity. To my knowledge, there has never been a documented case of any brain cancer going into spontaneous remission. Have you ever mentioned that to them? Yes, again with no intelligent response. So they are quite content to administer the same cancer causing, toxic treatments, when they know about your daughter’s success with Antineoplastons? Absolutely. It amazes me that some of them can sleep at night. Has your opinion about the medical profession, specifically cancer specialists, changed since Tori’s recovery? If it has, in what manner? Yes, it has changed a lot. I guess the biggest change would be that I no longer sit back and believe anything a doctor tells m e and that we have to take our healthcare into our hands by searching for legitimate options. I believe we have the right to choose. What do you think about the fact that some 3,000 children in the US (untold thousands worldwide) this year will be diagnosed with some form of brain cancer, and their families will have to face the same horror you did, the horror of losing a child. But virtually all of them will not be told about Antineoplastons, the treatment that cured Tori? Finally, I commend you and your husband for finding a way to cure your daughter, when all the “experts” said it was hopeless. You gave her life when she was born, and then you saved her life by finding Antineoplastons. I thank you once again Kim for answering my questions and sending me the photos of Tori. Give my best to your family. Dr. Burzynski is a great rarity these days. He is a courageous man who risked everything battling the FDA for over 15 years so as to allow cancer patients access to his treatment. A doctor who puts his patients well being before financial gains. But how many people diagnosed with cancer this year will ever find out about Antineoplastons? A tiny percentage, because very few mainstream oncologists will inform their patients about a treatment that has yet to be approved. And why is that? The NCI and ACS have supposedly been searching for decades for any and all treatments that are effective against cancer. For over 15 years Dr. Burzynski’s treatment has shown that it is effective. Many cancer patients, including some very young children with supposedly hopeless brain cancers, are alive today because of Antineoplastons. Here we come to the most crucial questions of all. Why did the FDA try their utmost to ruin Dr. Burzynski by involving him in 4 court cases? Why did the NCI make certain Burzynski’s clinical trials failed by diluting his treatment and enrolling patients who were the least likely to respond to Antineoplastons? If this was a one-time only event, we could dismiss it as an aberration; on overzealous government agencies. But the persecution of Dr. Burzynski is not an aberration, but the norm. There have been many well-documented cases in the last 70 some years of doctors/healers who discovered an effective cancer treatment, only to find the full force of the cancer agencies trying to destroy them and their discoveries. I have learned about several during my research. Dr. William Koch/Glyoxylide, Dr. Andrew Ivy/Krebiozen, Harry Hoxsey method/herbs, Royal Rife/radio waves, Ernst Krebs/ Laetrile/Amygdalin, Gaston Naessens/714 X, Dr. Lawrence Burton/Immuno-Augmentative Therapy, Dr. Max Gerson method/diet. What, if anything, does Dr. Burzynski’s Antineoplastons have in common with these other treatments? Most of them are natural; all of them are inexpensive to produce, especially when compared to the enormous costs of conventional treatments. If cheap cancer treatments with virtually no side effects were allowed to freely compete with the cancer causing offerings of the pharmaceutical companies, the outcome is obvious. The pharmaceutical companies, and the hospitals that administer their drugs, will lose tens of billions in profits. And this I believe is the reason Dr. Burzynski, and the people who have gone before him, have been publicly vilified as “quacks” and their treatments discredited. The fact is that the pharmaceutical companies control American medicine, and they are only interested in treatments from which they can derive a profit. Every cancer patient in America, and the world, should have free access to Antineoplastons. It is intolerable, not to mention totally un-American, to give a profit obsessed industry a monopoly over Americans healthcare. Nobody should have the right to force toxic chemicals down our family’s throat, especially when Dr. Burzynski’s treatment has proven effective (for some cancers) and does not have appalling side effects. One point, in which I disagree with Burzynski about, is the possibility of medical freedom of choice happening in America. It would happen in a year or two if enough Americans demanded it. You can help make that a reality. Please forward this interview to as many people as you know, as well as media outlets. Around ten thousand Americans die every week from cancer; we simply must have medical freedom of choice. Thank you for your time.